Siberian Quaesitor Scientiam- "Knowledge Seeker"
Often the picture of composure, Siberian appears to emulate his own personality in the way he is formed. When one first happens upon him, a scent akin to old parchment and candle wax can waft off of him at the slightest breeze, born of his near constant contact with the books he loves so much. His countenance is often aloof, but a kindly, mischievously paternal smile seems always ready to twitch to life upon his lips- laugh lines around his eyes attest that he is at heart a lively soul despite his middle age. His gaze is keen and misses little, always sharp and intelligent, but looking with tender exasperation on those younger souls who are blessed with his fondness. His voice holds a slightly roughened English accent that is neither too deep nor too high- the pleasant sound, coupled with the dark gold spectacles perched on the bridge of his nose, gives him a fatherly, scholarly air. His form is willowy and wiry, not so much built for strength- but he is quite limber and finds speed to his great advantage, though as he ages the stamina lessens bit by bit, a fact which thoroughly frustrates the cordial 'professor'. He is vaguely shorter than the average horse, but makes up for it with lithe legs and a sturdy barrel. His coat is velvet-soft and silken to the touch, though coarser in his years around his cheeks and forehead, as well as his heels. He struggles in the cold weather, as it is not made for extensive winter warmth. But the colors are vibrant and eye-catching; His base tone is of deep, dark navy. This lightens to a charming sapphire blue under his chin, lightly down his neck, and brightening again on his breast and underbelly/armpits. The inside faces of all his legs have the same vibrant hue. The navy darkens further into near-black around his muzzle, ankles, and eyes, melding smoothly as if a gradient with the rest of his fur. His eyes, themselves, are a glittering topaz, darkening beautifully around the outside of the iris, brighter and more vibrant near his pupil. a few inches below these bright orbs begins gently stroked lines of the same sapphire as his underbelly, splitting into two lines on each side to go through his nostrils and the other to reach over and to the bottom of his lips and chin. Varying tones of red in hypnotic, dapple-streaked lines begin at his shoulder blades on both sides and reach along his ribs to end at his back just above his haunches. 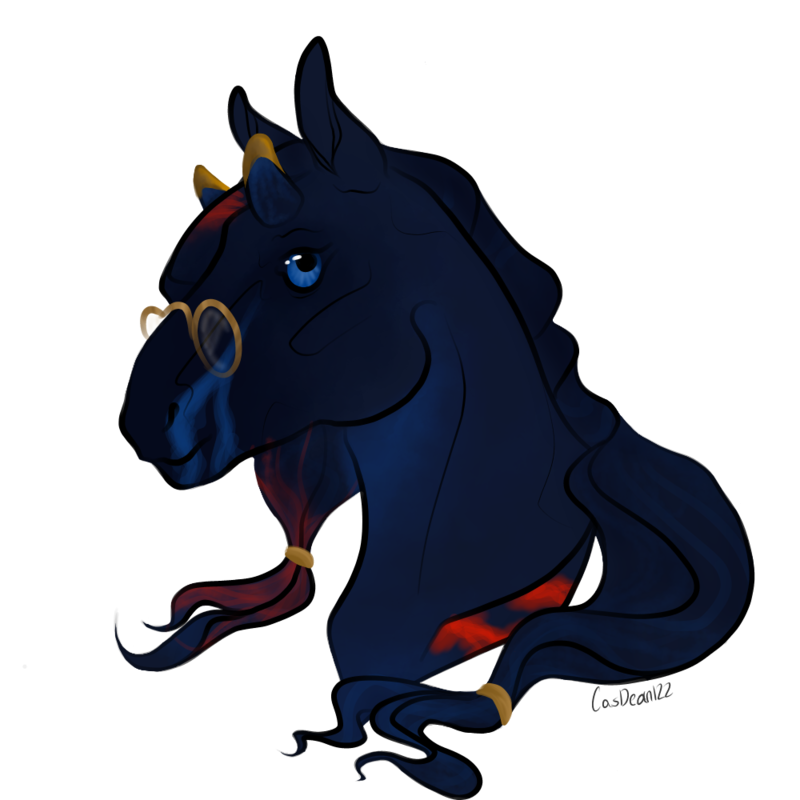 His hooves are only slightly lighter than his pelt, and cloven- they are neatly polished and trimmed so that the toes face sharply inward, allowing him greater traction and a far more nimble ability to traverse steep inclines to a certain extent. just where the hoof meets fur, there is a painted ring of gold leaf paint outlining each. His tail is long and leonine, the mane at its end smooth and lustrous, gently waving in tones of darker navy than his pelt, streaked with light sapphire strands and highlights. His mane is this same color- the first half of his mane is quite long, and drapes over the side of his neck, pulled so there is no part of his mane in front of his ears, coaxed neatly to rest against his neck behind his left ear. It drapes just above his shoulder, clasped a few inches from the ends with a gleaming golden ring. This portion of hair is streaked vibrantly with the same bright red as the markings on his sides. 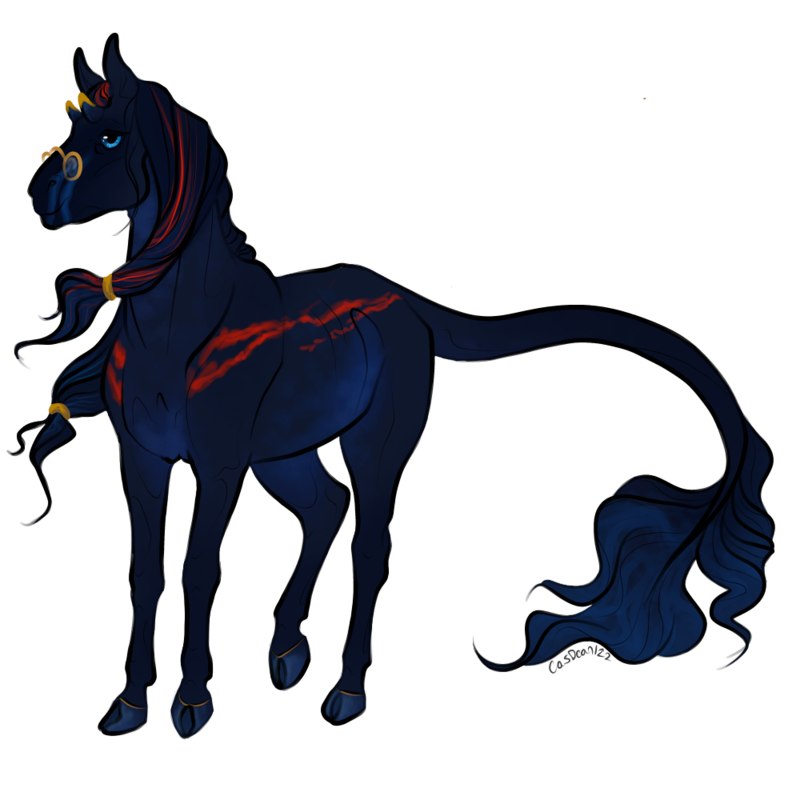 The lower half of his mane is pulled into a large single 'ponytail' along his crest and allowed to fall on his right shoulder, where it is long enough to drape past his armpits when standing still. This is also clasped with a golden ring, though slightly higher up. 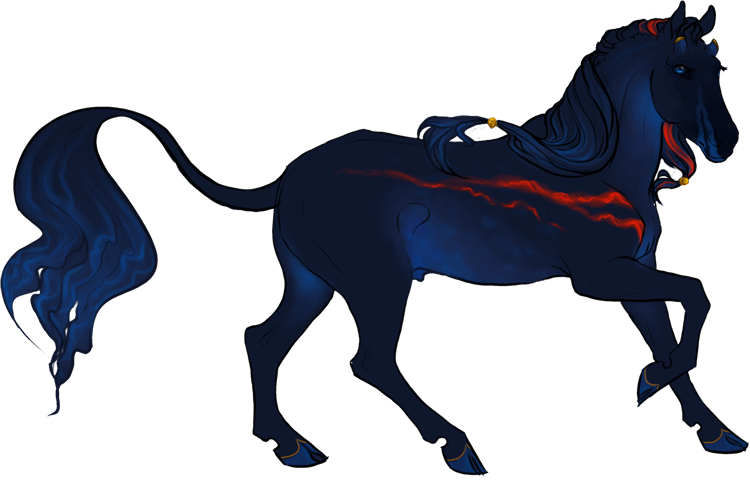 His horns, just above his brows, are short- cut down to be much smaller than they were in his youth, and capped with smooth gold ore to prevent them from growing. They are dark navy, but hold fascinating striations of light blue near where the tips disappear into the gold.